#71. Unam, shameful and apologetic, begs Rom to let him join them. He does, and along with Seeker and Scanner, they soar into space in search of more of their comrades. 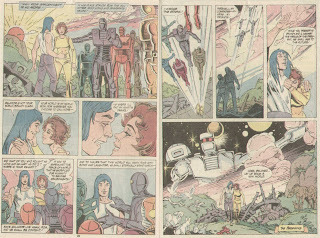 Rom reminisces about his lost love Brandy, as they arrive upon a world that contains two Spaceknight bio signatures. There they find Vola the Trapper, aiding the indigenous people in a planet-wide war against the Wraiths, led by another Spaceknight by the name of Raak. 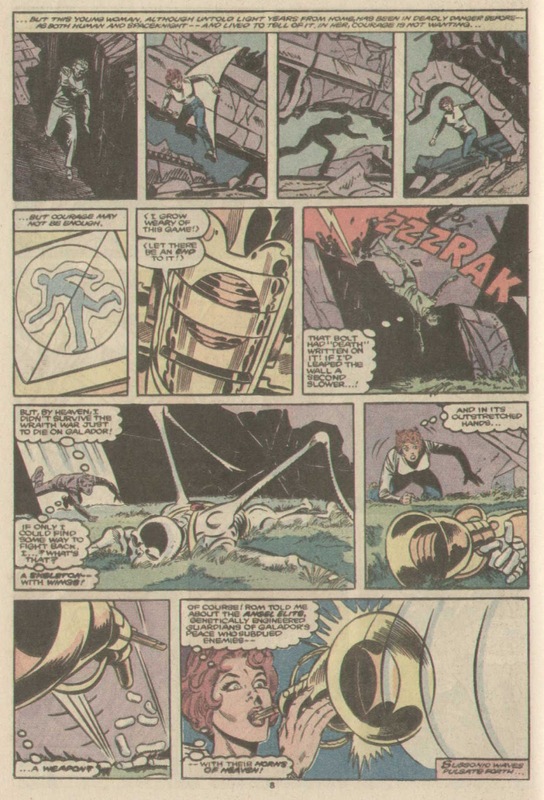 Rom cannot fathom a friend willfully aiding the enemy, so they attack the Wraith army and Raak. 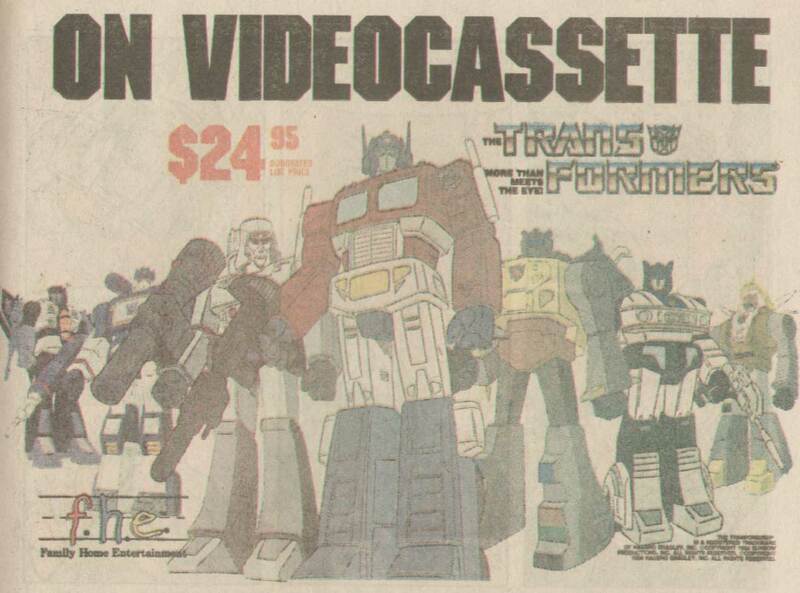 I used to love the art in this Transformers videocassette ad. 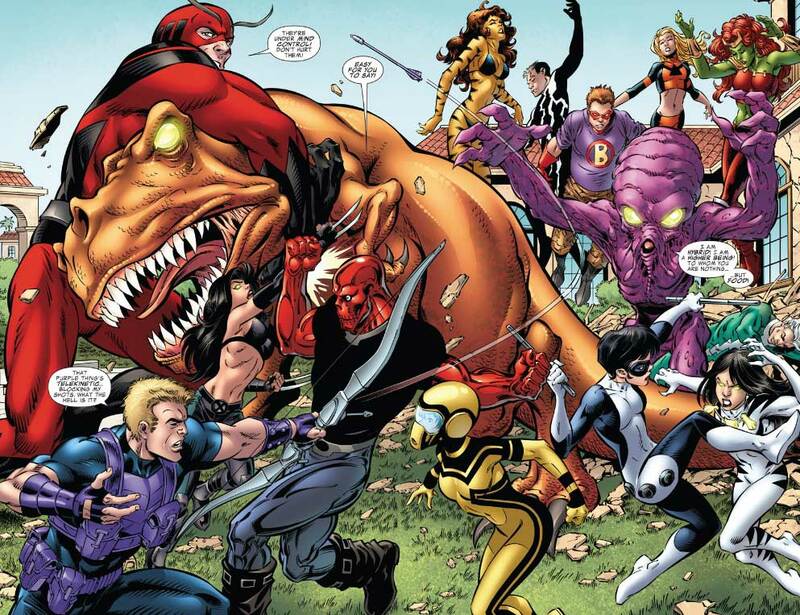 Raak and Rom are pitched in battle, nearly equals in power. As Raak continues to assault Rom with his microwave powers, Unam steps in and takes the full brunt of his blast instead of Rom, killing him. 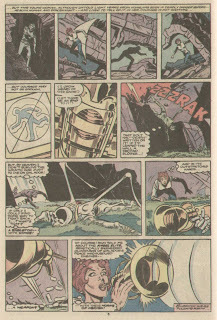 Enraged, Rom banishes Raak and the remaining Wraiths to limbo. 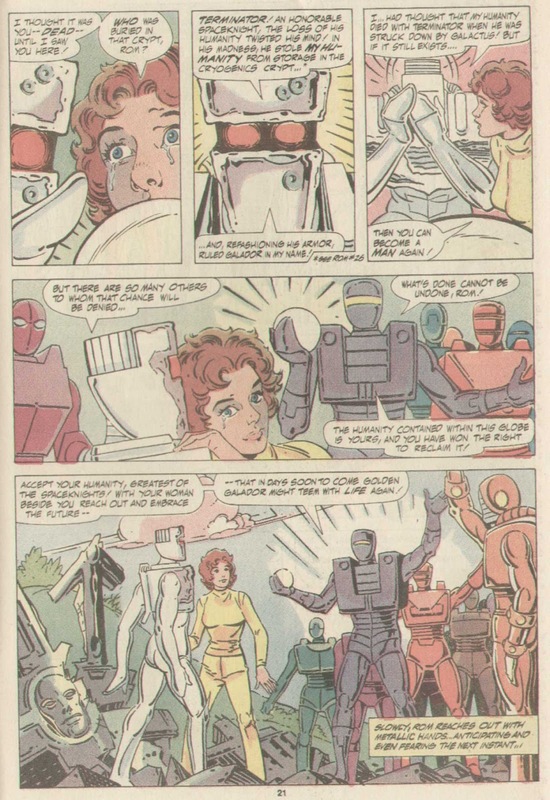 My brain thoughts: The premise of the series is crystal clear now, with Rom and his Spaceknight brothers and sisters searching the galaxy for the rest of their clan, so that they can hopefully return home. I could see Unam sacrificing himself to save Rom from a mile away, but oh well, it works. Annual #4. This annual sees a deranged and dying Spaceknight attack a Shiar cruiser, killing the Praetor of the ship in his death throes. The doctor of the ship (also a forced servant) appropriates the armor and uses it to kill everyone on board and destroy the ship. Rom and the Spaceknights come upon the wreckage, only to drawn aboard a newly arrived ship containing Gladiator and the Shiar Imperial Guard. Long story short, they fight, and then eventually help each other to defeat the usurper of the Spaceknight armor. Calling into question the tactics of the Shiar Empire, and their dominion over the worlds in their star system. Gladiator rewards Rom and his fellows by granting them access to a Shiar Stargate, sending them home to Galador. My brain thoughts: This one isn’t as cool as it should have been, with Gladiator and Rom going one-on-one a little bit disappointing. There was some message about freedom I’m sure I was supposed to get, but I didn’t. Ditko and Al Milgrom did the art on this issue, and it is serviceable . #72. Oh greatness, a SECRET WARS II tie-in. For those of you unaware, SECRET WARS II was the follow-up to the extremely popular first miniseries, and unlike its fun predecessor, part II was a complete mess. 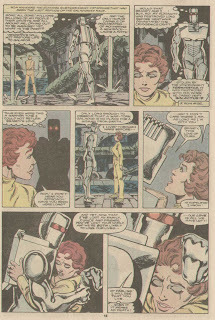 In this issue, the Beyonder continues to try and understand human desire, and has honed in on Rick Jones, Brandy Clark, and Cindy Adams. 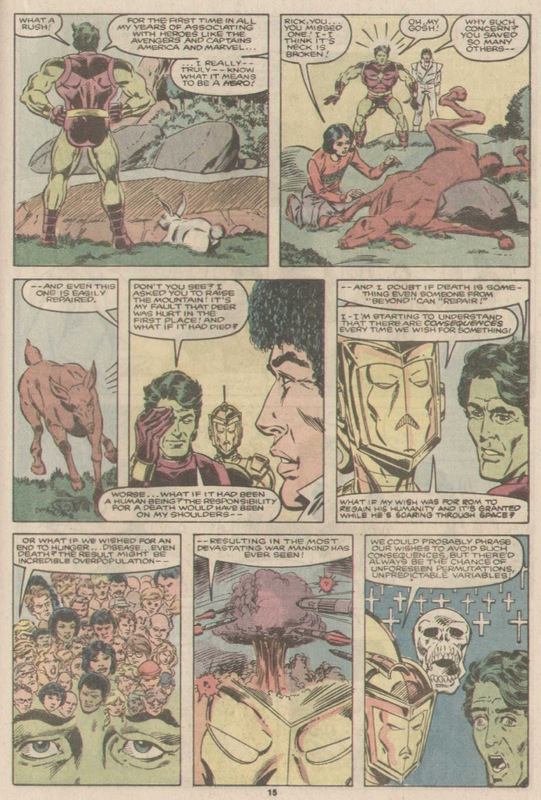 Questioning them about their desires, the Beyonder cures Rick Jones of his cancer, makes Brandy Starshine once again, and removes the Wraith mind from Cindy’s head. 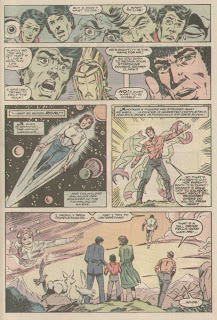 Fearful and doubtful of the Beyonder, they discuss with him more about human desire, with Rick being granted super powers as the Beyonder continues to try and understand. 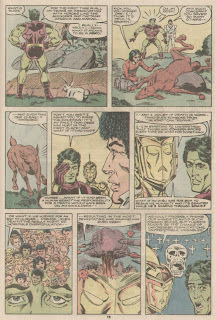 Cindy wishes she had asked for her parents to be returned to life, and the Beyonder informs her that they never really died. Their essence is only imprisoned in the body of the Wraith that took the lives of their human bodies. Rick and Brandy Starshine are sent into limbo to retrieve the Wraith responsible, where Starshine discovers with the light eyes that all the Wraiths contain the essence of the humans they killed. 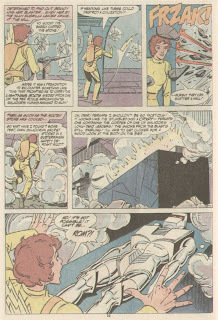 Locating the Wraith that harbors the souls of Cindy’s parents, they return to the Beyonder, where he returns them to life, and sends the Wraith back to limbo. Her greatest desire granted, the Beyonder turns to Rick and Brandy. Rick has decided he doesn’t want the responsibility of powers after all, but he does want to live, cancer-free. Brandy doesn’t want to be Starshine anymore, but she does want to be reunited with Rom. 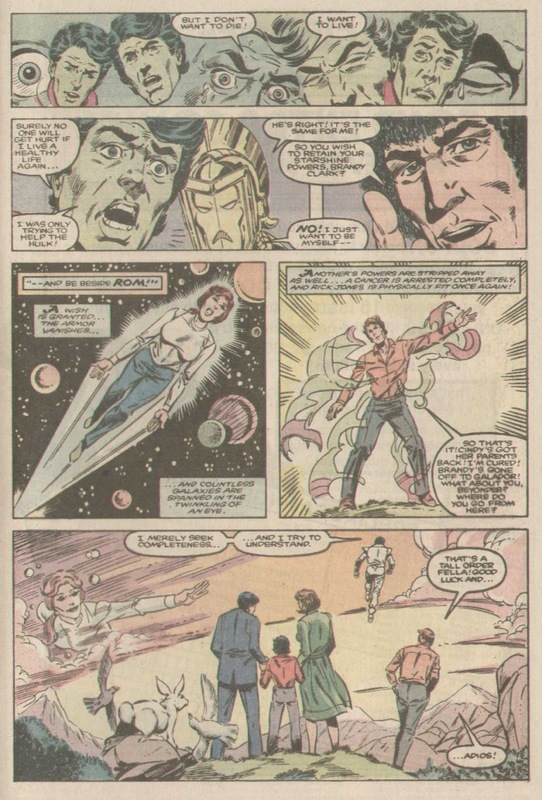 The Beyonder returns both to their human states, and sends Brandy streaking through the universe towards Galador. A happy Cindy remains behind with her revived parents. My brain thoughts: What an unconventional way to break up this trio, and get Brandy to Galador, presumably to be reunited with Rom. I was wondering how Rick was going to be cured of his cancer, even though part of me hoped he was going to be erased from existence and my memories forever. It was nice to see little Cindy get a happy ending after all. One big problem I have with the idea of the Wraiths retaining the souls or essences of their human victims, is that no way after crying about it for twenty-three issues, does Brandy leave limbo without the remaining psyches of her dead family and friends. It is addressed, but quickly dismissed, and there is no way that would happen. 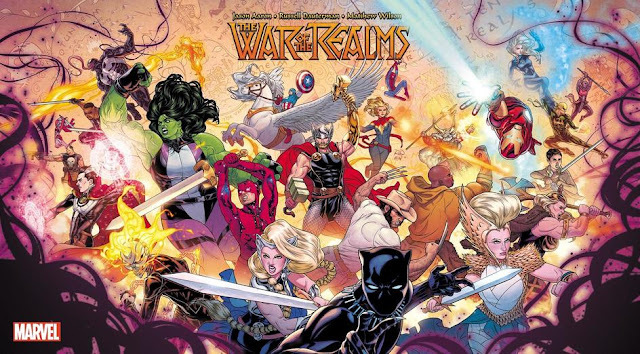 Oh well, despite my trepidation about this being a SECRET WARS II tie-in, it actually turned out to be an enjoyable issue, and perhaps represents the series ending on a high note. #73. Brandy arrives in a field of paradise and animals, like something out of a Disney cartoon. Quickly her joy turns to fear, as she comes upon the ruins of a city. A Spaceknight spots her, and attacks her, seeking to destroy her. Next to the skeletal remains of a member of the Angel Elite, she finds a weapon she uses to defeat the Spaceknight. Humans come from under the ground to finish off her attacker, and to take her back to the rest of their resistance. Locating a translator, they relay the tale of how Galador fell into ruin. After the Galactus incident, the people of Galador felt defenseless while their mighty Spaceknights defended the galaxy. They decided to create a new race of Spaceknights, more powerful than the first, but completely lacking any of their human bodies. These new Spaceknights eventually let their power corrupt them, and sought to kill the human population of the planet. Brandy comes up with a plan to threaten the human bodies of these new Spaceknights in the hall of science, in the hopes of ending their reign. They make their way to the hall, followed soon by the rogue Spaceknights. Preparing to make good upon her threat, Brandy is interrupted by the arrival of Rom and his friends, via the Shiar Stargate. Using the distraction, the rogue Spaceknights slay some of the human resistance, and then melt the containers holding the bodies of all of the Spaceknights, new and old. My brain thoughts: This isn’t where I was expecting these final issues to go, but it is a pleasant surprise. It fills me with much joy to see the series ramping up to a (hopefully) fantastic conclusion. 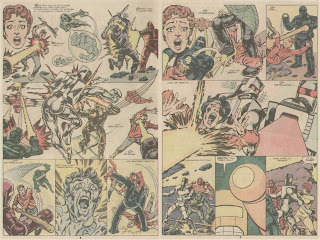 Rom’s fellow Spaceknights attack the rogue Spaceknights, with many of the Galadorian humans perishing in the crossfire. Rom is frozen in indecision, unable to reconcile attacking his own people with his Spaceknight code of honor. With all of the humans slain except Brandy, Rom and his friends retreat below the surface. 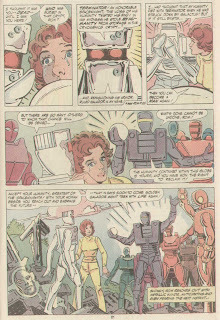 The rogues Spaceknights meet with their warlord, a Spaceknight named Lord Dominor. Rom and Brandy reconnect, lamenting yet another time the loss of Rom’s human body. The other Spaceknights are depressed over the losses of their bodies, until Brandy rallies them all to defeat the out of control Spaceknights like the heroes they are. Storming the rogue’s tower, they seem to be winning the day. Rom confronts Lord Dominor, who explains that this has all been a master plan of his to create a new master race for Galador, by slaying the weakest of them. He tries to convince Rom to turn Brandy over to him, as he is the only one out of everyone left that still possesses his humanity. 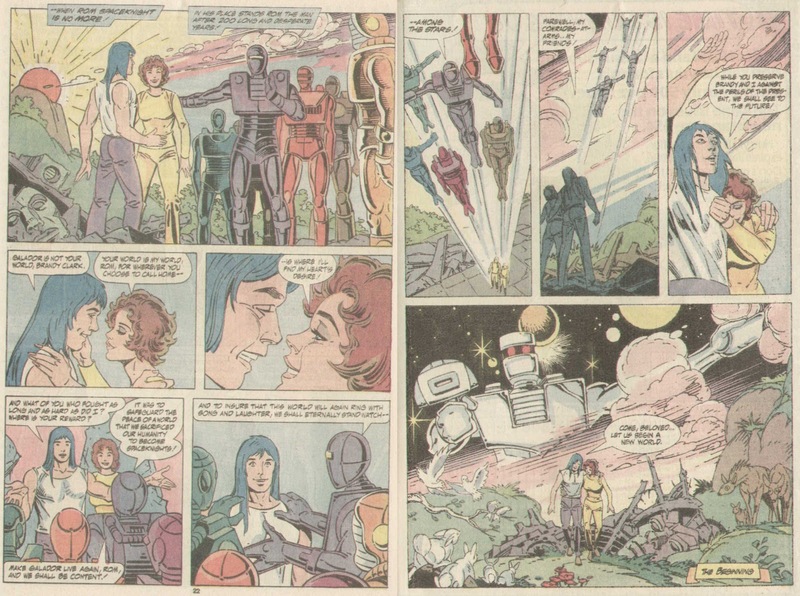 Rom appears to be torn between his love for Brandy, and wanting to see the people of his planet continue on, even if it means sacrificing his love to the only man that remains of his people. They are interrupted by the rest of the rogue Spaceknights, but Lord Dominor holds them off by challenging Rom to a duel. 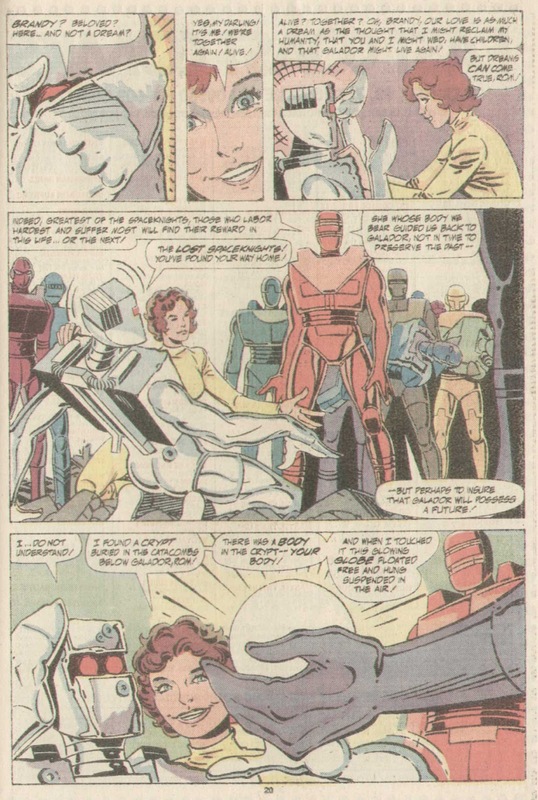 Confident he will win the duel, but still bargaining in silent, Dominor promises to let Rom’s fellow Spaceknights live, as long as Brandy is turned over to him. My brain thoughts: Ditko and Byrne make for a sometimes brilliant combination, and yet sometimes mundane as well. Considering these are two of the more prominent artists of my childhood fandom, it is an extreme pleasure to see the two of them worked together on an issue. A real treat. The stakes are set high for the final issue in this one. The evil villain bargains with Rom, his love or the future of his race? 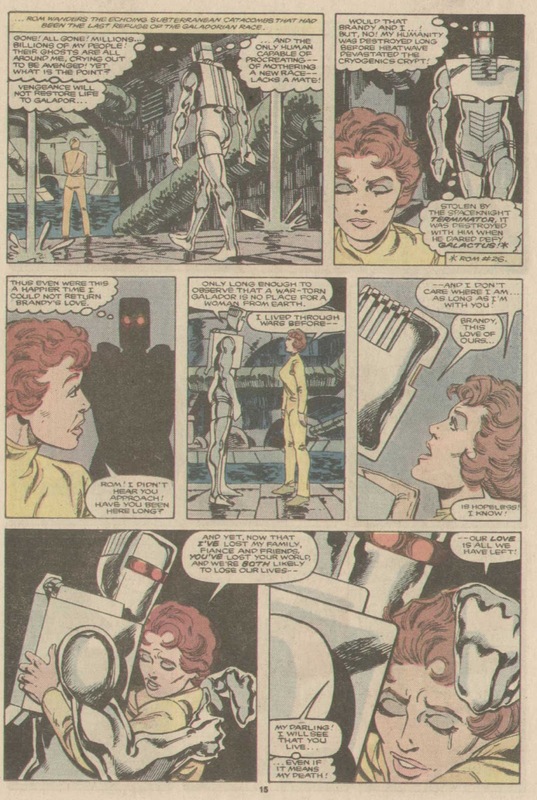 Remembering all the different ways people have been changed to and from Spaceknights so far in this series, I think Rom should take this creep out and find another way to find a human body. What’s going to happen? The pulse-pounding conclusion to the Rom saga is next! #75. This is it, the end of the show. The last hurrah! The conclusion to the Rom saga that was six years in the making, at that point in time. (Also the conclusion of several months of reading and writing for me). Rom and Lord Dominor begin their duel. On the defensive only, Rom struggles whether or not to let Dominor win, so he can repopulate their race with his beloved Brandy. 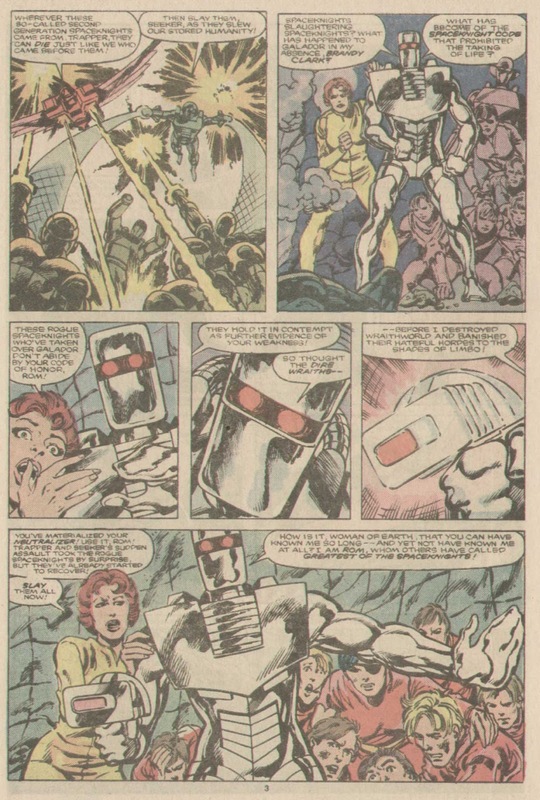 Deciding against it, Rom fights back instead, while his friends attempt to contact the remaining Spaceknights across the galaxy. Brandy searches the catacombs in her hiding place beneath the surface. She comes upon a wall with a strange glow in the center. 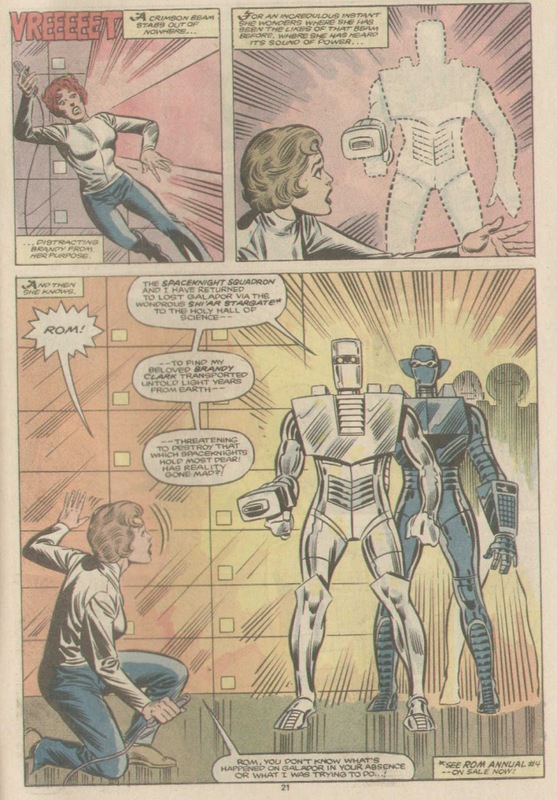 Using weapons to blast her way through the wall, she finds the duplicate body of Rom used by the Terminator! The duel between Rom and Dominor continues on, until Rom summons his neutralizer to finish it. 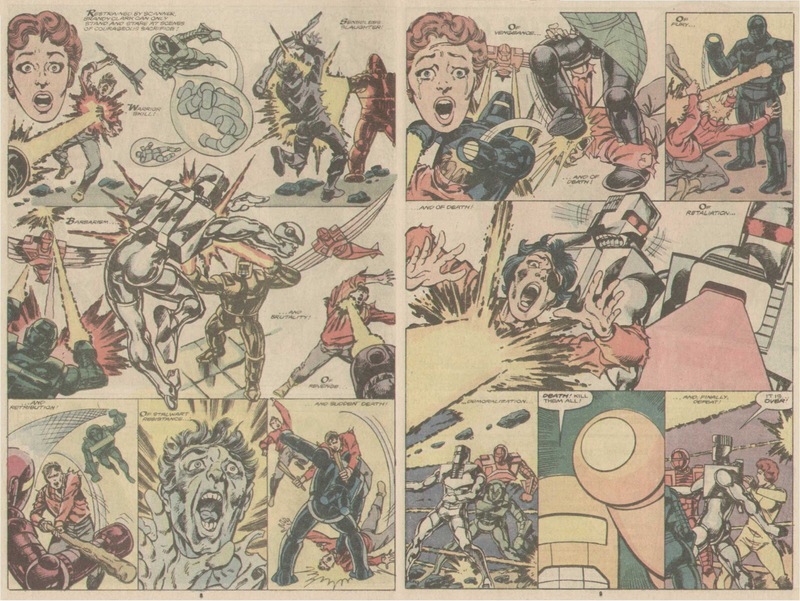 The rogue Spaceknights offer to let Rom join them, as they plan to destroy Galador and everyone on it. Joining hands to unleash their “ultimate power”, which they believe will destroy everything around them but them, instead it destroys only them. A failsafe put in place by Dominor, as his only goal was ever to create his master race. In the ruins of the tower, Rom and Dominor continue their debate, until Dominor realizes his human remains had been hidden away in the tower, now destroyed along with it. 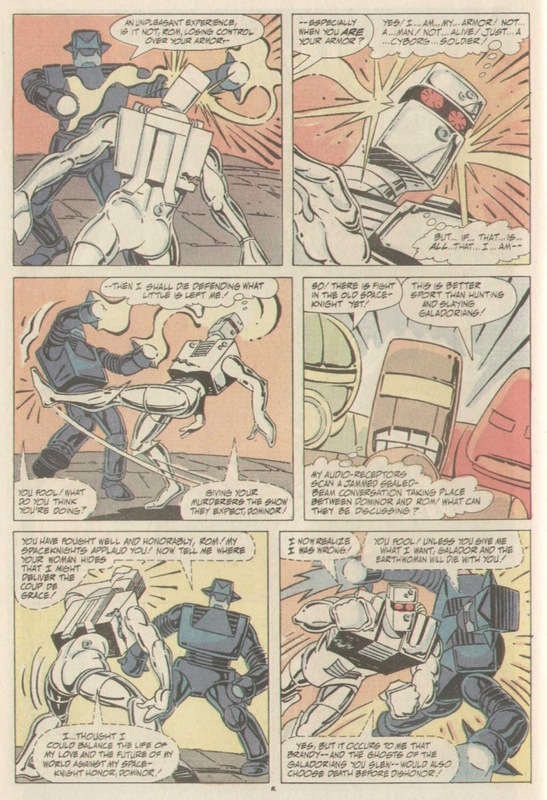 Attacking Rom and grabbing his neutralizer, Dominor uses it to commit suicide. What happens next, well, I’ll simple let the pages themselves tell the tale. My brain thoughts: A fitting and happy ending for Rom and Brandy as the series ends on a high note. It occurs to me that this is probably one of the most self-contained and complete stories in superhero comic history. 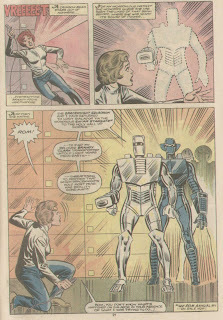 While it is unfortunate that we will likely never see new Rom tales, due to Marvel no longer having the license, the positive side is that we can go on believing that Rom and Brandy lived happily ever after without ever having to worry about a sequel or new series that reveals that Brandy was a Wraith spy all along, or some other new hell foisted upon this fabulous little tale. 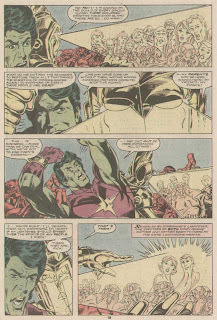 (Though, now that I think about it, I believe this has already happened in the ANNIHILATORS miniseries that followed THE THANOS IMPERATIVE, I might have to reread that now). Somewhere, far off in space, Rom and Brandy are there, creating a new race of Galadorian and human super babies to repopulate their planet. It’s a nice thought. 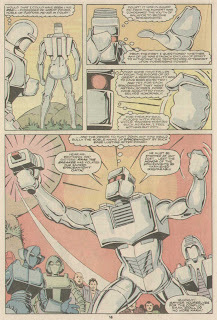 My final final brain thoughts: ROM: SPACEKNIGHT was and still is a series very well worth reading. I guess I should take this opportunity to let you know that this series came along for me at a very difficult time in my life, and it hit me in just the right spot to help me get through it. You see, I’ve just discovered that I am a cyborg warrior from another planet, and that my human body and emotions are forever lost to me. All kidding aside, this was for the most part an enjoyable read and an enjoyable venture. Hopefully I’ve sparked at least one person in this world to check out this series for themselves, or at the very least I satisfied their desire through my recaps and scans. The X-Men and Spider-Man get a lot of justifiable attention for their classic storylines in the 1980s, but that is not all Marvel had to offer. 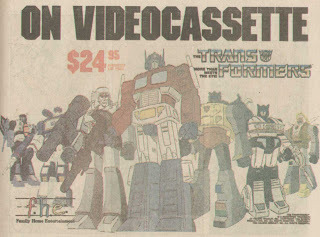 They were firing on all cylinders at that point in their history, and you can see that even in a little throwaway licensed toy comic that I’m sure nobody expected to last past one year. The dialogue and the art may seem a little dated for some, but to me, you can’t beat that era for unbridled enthusiasm and pure storytelling ability. Bill Mantlo may never have been the most talented writer, but as I got older, I began to realize more and more just how much of his stuff I cherished as a kid. He made up for what he lacked in skill with fantastic ideas and lots of heart. It’s no wonder I gravitated towards so much of his work. Sal Buscema, and later Steve Ditko, may not have been the most talented of draftsmen, but they knew how to tell a story, and tell it in an exciting manner. Buscema in particular provided some shockingly brutal artwork (for the time) involving the Wraiths and their various activities. 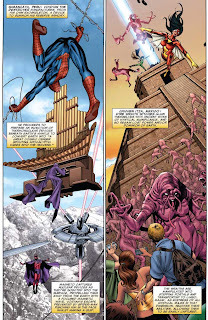 Ditko provided some excellent effects in unreal settings, much like his Dr. Strange work from earlier in his career. Both of them turned in stellar work that matched the story well, and the end result was a series of books they could both be proud of. As I said many times, the strength of the series often relied heavily on the guest star of any particular issue. The premise of the series was a pretty simple (yet clever) one, but prone to get old very quickly with only one main lead and a few supporting characters that can’t really help him out that much. 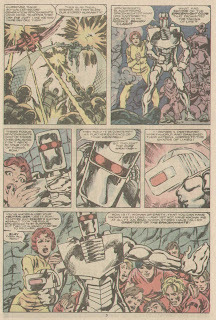 Having Rom interact with the other heroes and villains of the Marvel Universe was a pretty smart way to keep the book fresh, and to make the book matter. And boy did it matter, as you can see from comics that came out as recently as 2011 and 2012. 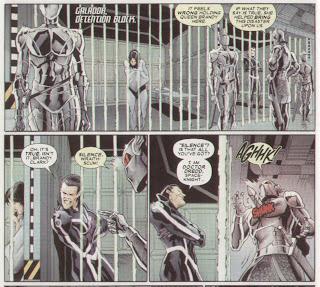 …or how about the diabolical Wraiths making a cameo in UNCANNY X-MEN (Vol 2) #9. 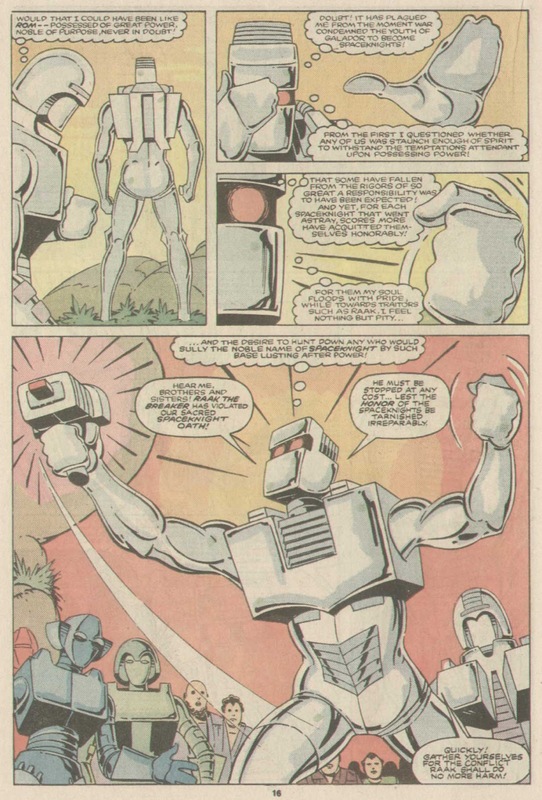 As you can see, Rom made his impact on the Marvel Universe. They may not be able to use him now because of licensing issues, but there are fans and creators out there that would love another shot at The Galadorian Gladiator. Maybe someday, they’ll get their chance. For now, we’ll always have these back issues to track down, if you ever feel the desire. This is me signing off. Now go read some more comics. If you check Marvel's October 2012 solicitations, they're reprinting the Spaceknights limited series by Jim Starlin and Chris Baltista. The question is why? Is there some big ROM-related project coming out soon? I think the Spaceknights kinda tie in to Guardians of the Galaxy, so they may be starting with the big movie push this early. They are allowed to use everyone but Rom (due to licensing issues), I think. Seems like there has been a small push to use the Spaceknights at Marvel lately. thanks for the heads up on this Dire Wraith appearance this one kinda slipped past me. it might make for a good posting on the ROM blog. 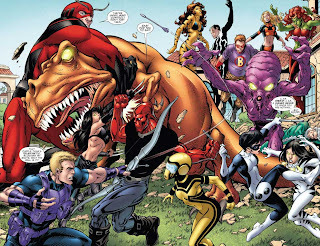 the annihilators was a real disappointment and the Hybrid return was mishandled the ROM legacy would have been better off had neither ever happened.